Harold LeMay was born in Yakima in 1919. After World War II he started a refuse collection business, the Spanaway Garbage Collection Company. He later built a trucking company, towing company and several other businesses. Above: The week-long motorcycle exhibit at LeMay Marymont will occur the week leading up to Father's Day. Through the success of each business, LeMay was able to build a collection of cars. In fact it was one of the largest single individual collections ever in the world, at its peak numbering more than 3,000 vehicles. In order to store and display part of the collection, LeMay purchased the Marymount School in Tacoma, a former military academy located on 80 acres. The land features 700 feet in elevation changes. More on that in a moment. The LeMay Family Collection at Marymount opened to the public in 1991. 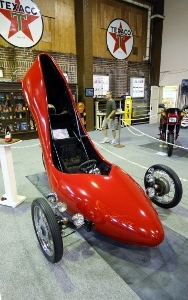 It’s a grand walk through time where one will see all sorts of collectible vehicles from the rare to the exotic, to the just plain fun. 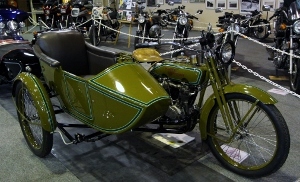 In addition, LeMay amassed quite a collection of motorcycles which are scattered through the collection. The week leading up to Father’s Day is Marymount Motorcycle Week. 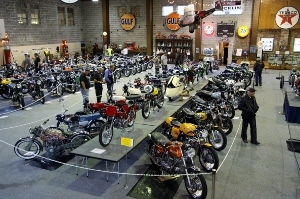 The affair kicks off by bringing several hundred motorcycles together in the main exhibit hall. The collection not only includes LeMay-owned vehicles, but bikes provided by the Vintage Motorcycle Enthusiasts and other clubs and private collectors. The scope of what is on display is extensive. In 2013, the LeMay foundation tested this bike show and it was met with great success, so they will repeat it again in a bigger way for 2014. The Pacific Northwest Museum will again be bringing in large-format historical photos featuring motorcycle riders and events from throughout the 20th century in the Pacific Northwest. 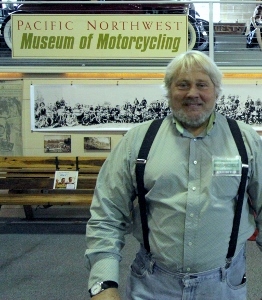 At right: Tom Samuelsen with the Pacific Northwest Museum of Motorcycling will be on hand with lots of information about the past. 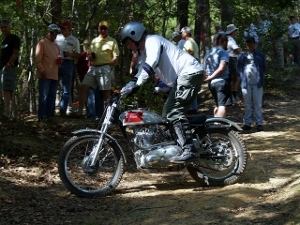 For 2014, a special treat is the addition of an AHRMA Vintage Trials event. And this is where those elevation variations come into play. The entire circumference of the property will be used for the course in this national competition which will happen on Saturday, June 14. Turns out a lot of people miss the extent of the motorcycle collection by visiting the museum and only experiencing a few of the exhibit rooms. But there’s more on site to see: request a docent and get a personal tour of the entire grounds at no additional charge. Be sure to utilize this option when you visit. Weekdays are the best days to visit with less traffic and better availability of docents. If you visit on the weekend, be prepared to wait a little longer for a tour. They are closed on Mondays.